At the Singularity Summit earlier this month I came to see Paul Saffo’s talk. Famed as a forecaster and future thinker, I was expecting to hear what lay ahead in the world as the steepness of the technology curve continues towards cliff like proportions. Instead all were treated to a reminder that our new future is represented overwhelmingly in the negative by our artists and poets. He points out that if we can only imagine an awful techno future, that that is what we will get. So Saffo read the one piece he could find that depicts a world run by computers in a positive light. 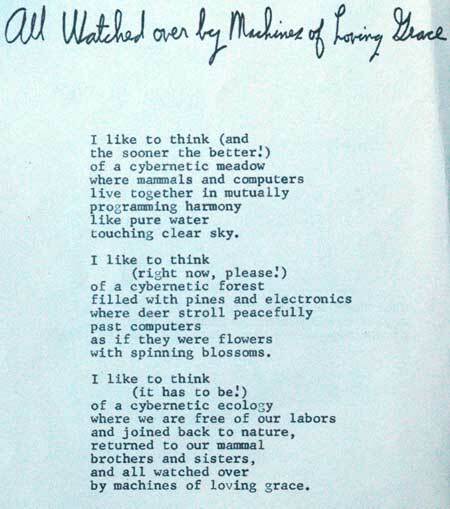 Amazingly it was written in 01967 by someone who was likely programming computers with punch cards. It is shown in the original above and the text can be found on Saffo’s journal.